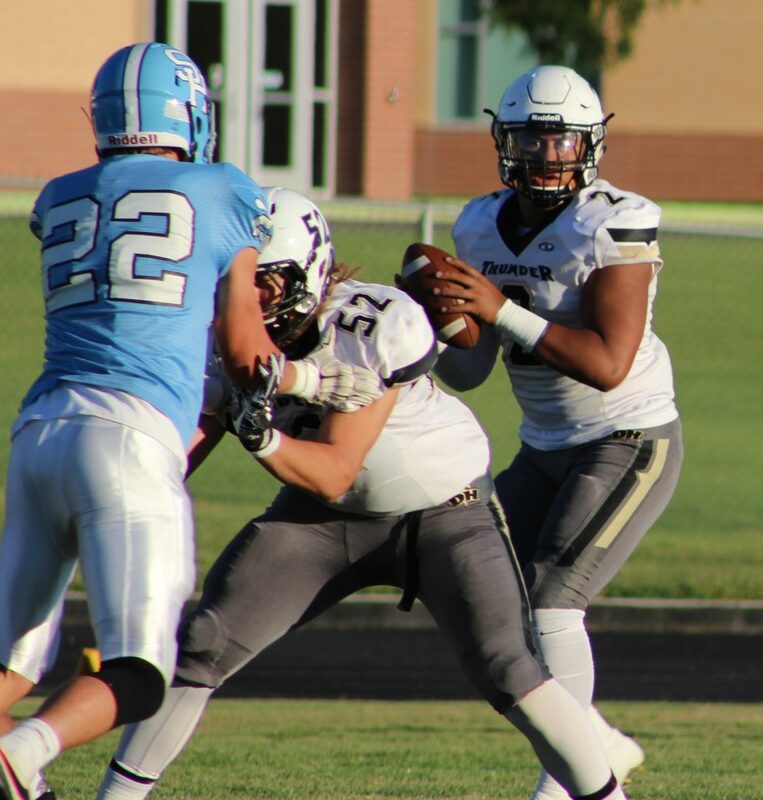 SALEM – After a tough overtime loss to Jordan last week, Desert Hills turned to senior Brock Parry to lead the team on the road at Salem Hills. 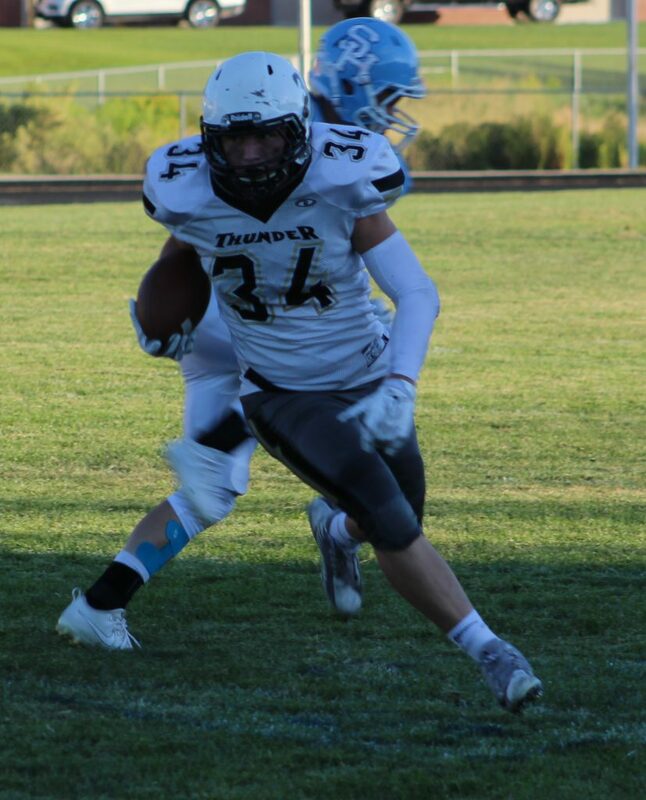 He did not disappoint, finding the end zone three times Friday, helping the Thunder run away with a 56-10 win over the Skyhawks. The Thunder exploded with a 28-point third quarter to blow it open against SHHS. Parry, who racked up 130 yards rushing on 14 carries and another 106 yards receiving, helped turn a close game at half (21-10) into a blowout. By the time the night was over, DH had accumulated 634 yards of total offense. 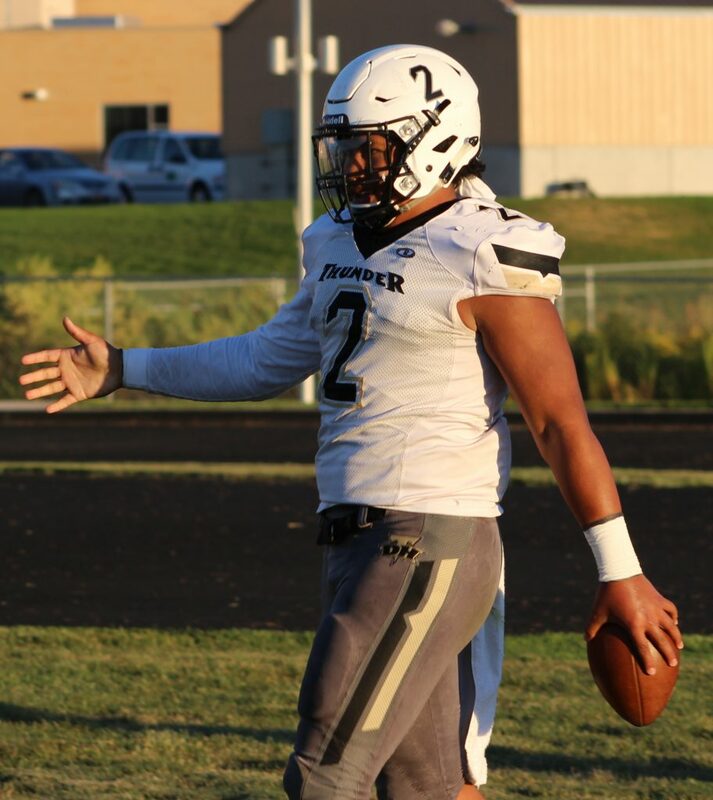 Sophomore signal caller Sewell also looked cool and composed against the Skyhawks as he put up 239 yards passing and four total touchdowns (with no interceptions). 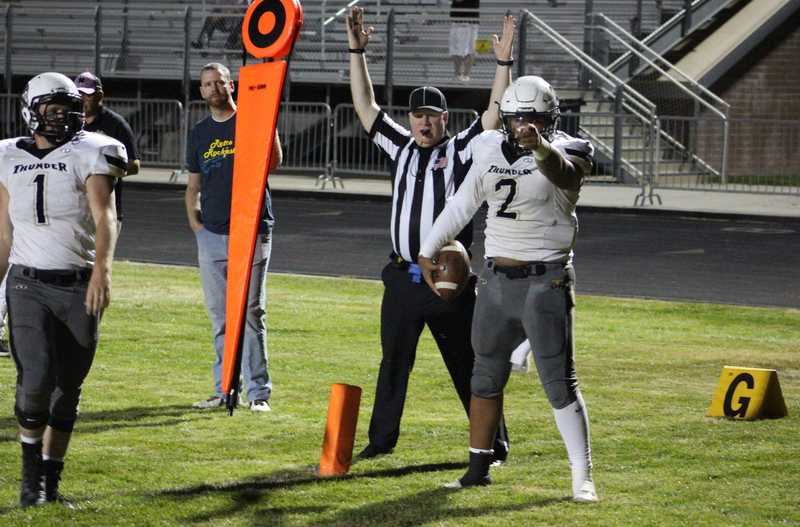 In a game that was closer than the final score indicated, the Thunder watched as Salem elected to receive to start the game and on the first play from scrimmage ran a double-reverse pass that caught the Thunder napping. Salem QB James Nelson bombed it to Tyreese Williams, who scored from 78-yards out. Luckily for the Thunder, an illegal man downfield penalty negated the big play. 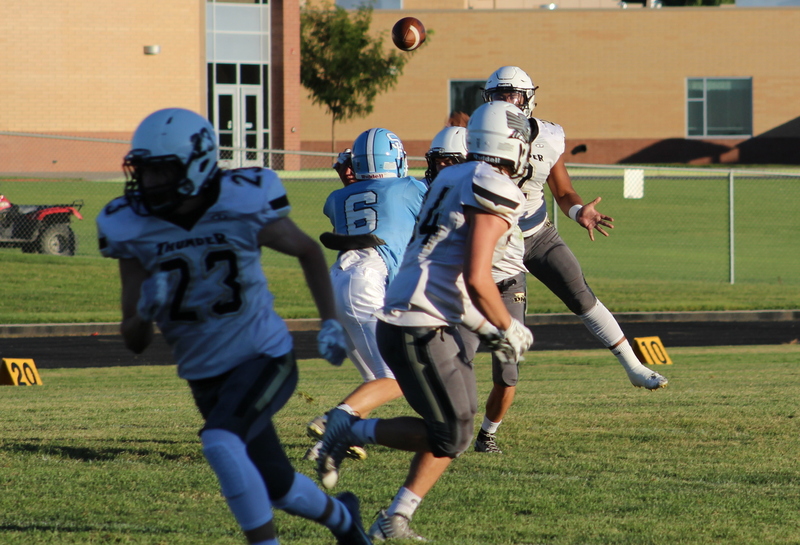 Actually, by the time the first half was over, Salem Hills watched in horror as referees would call back three of their touchdowns by way of penalty. After Salem’s double reverse was called back on the first drive, the Hawks still pieced together a beautiful 78-yard drive in just 2:32 as Nelson found Williams for a 4-yard TD pass. 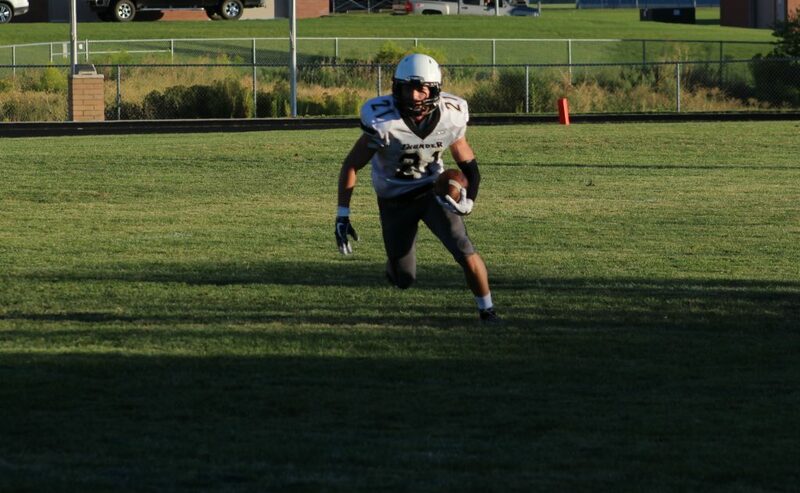 Desert Hills responded with an efficient three-minute, 80-yard drive of its own. Parry finished the drive with an 8-yard pound up the middle to tie up the game. Over the next several drives, defenses on both sides stepped up and forced turnovers on downs. 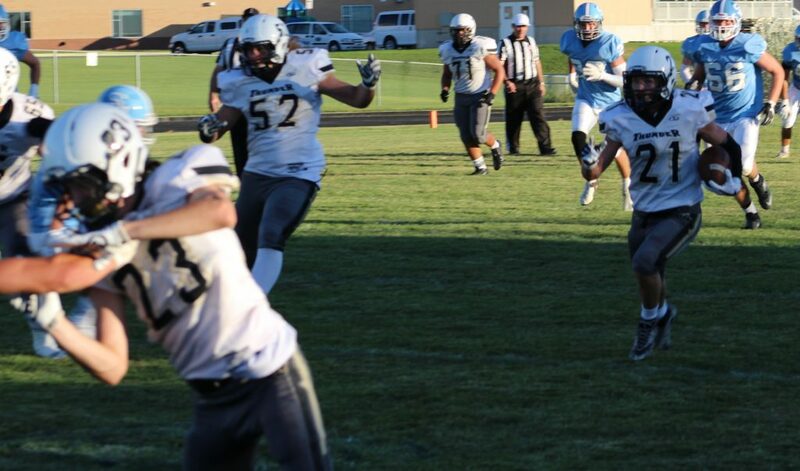 Salem mounted a drive that stalled at the DH 36-yard line when a host of defenders sacked Nelson on fourth down. 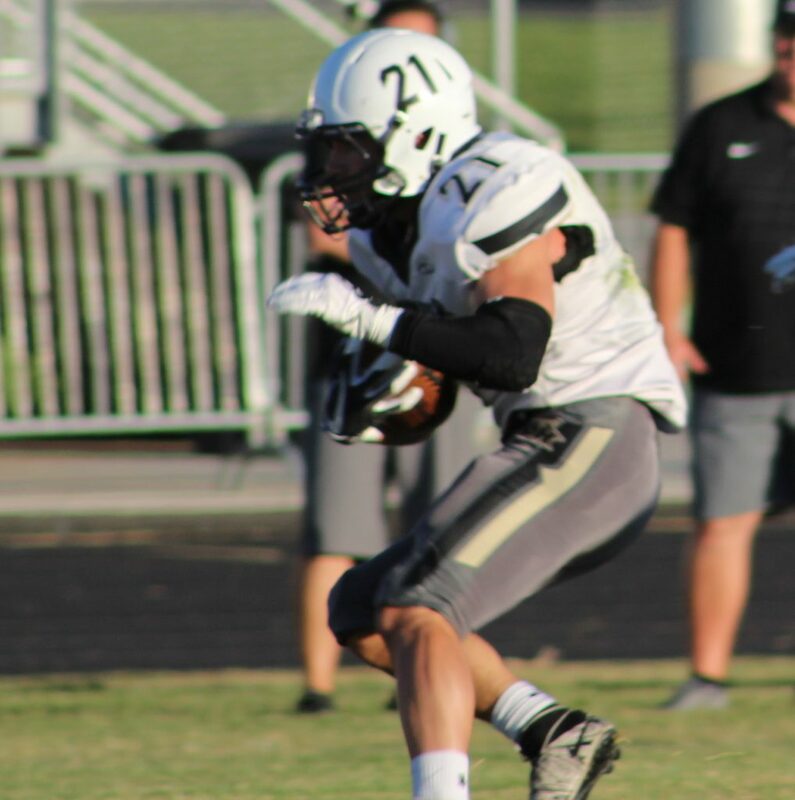 Desert Hills drove up field and Sewell found himself free after scrambling in the backfield and took off for a 19-yard TD scamper to put DH up 14-7. On the following drive, Salem’s Garrett Lloyd ripped off a 56-yard TD run, only to have it called back by holding. 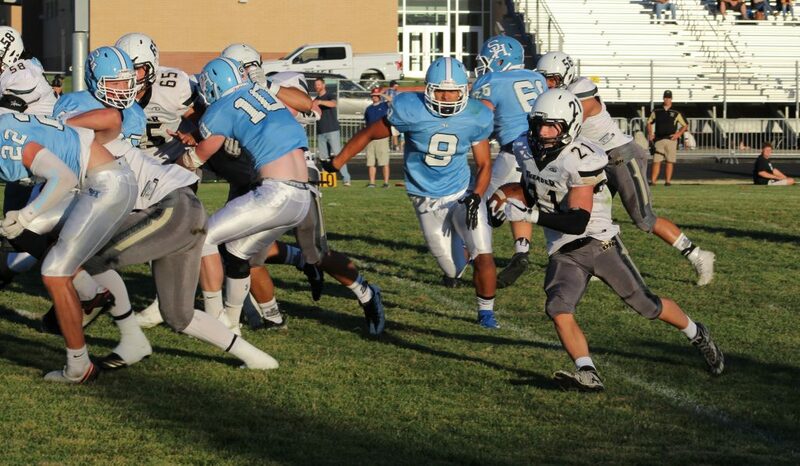 The Skyhawks stalled out and were forced to punt. 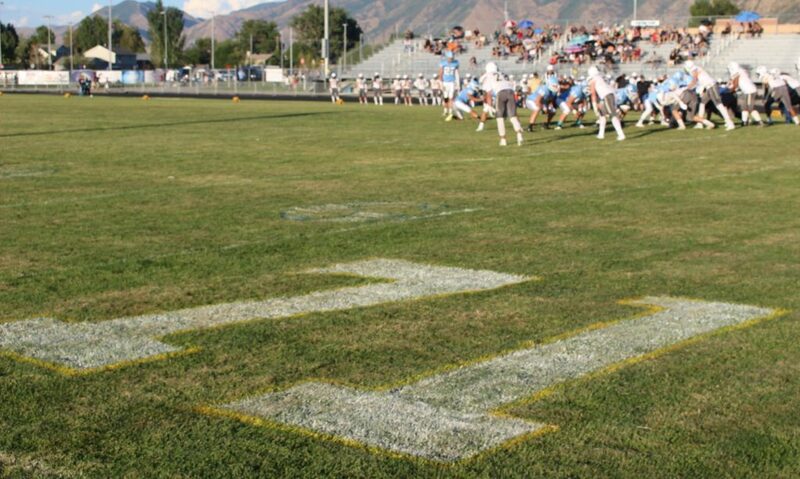 SH managed to pin Desert Hills at the 7-yard line, but on the first play of the drive, Parry cranked off a 55-yard run. 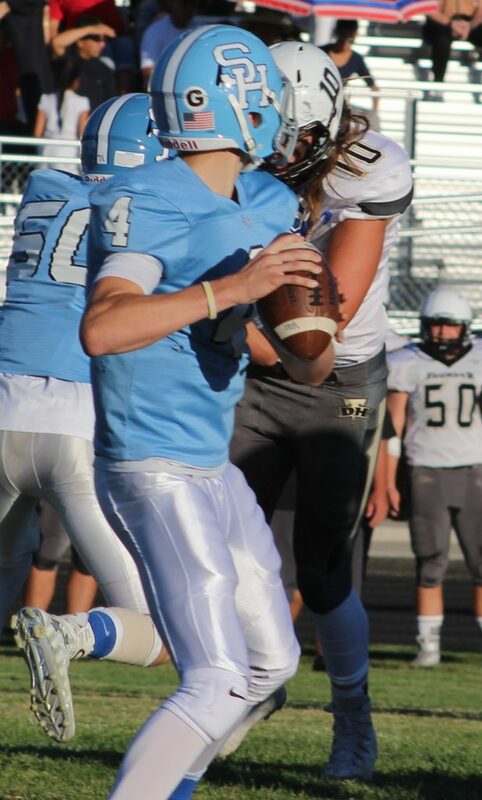 Desert Hills would later cap the drive with Sewell finding favorite target Parry for a 9-yard TD pass. 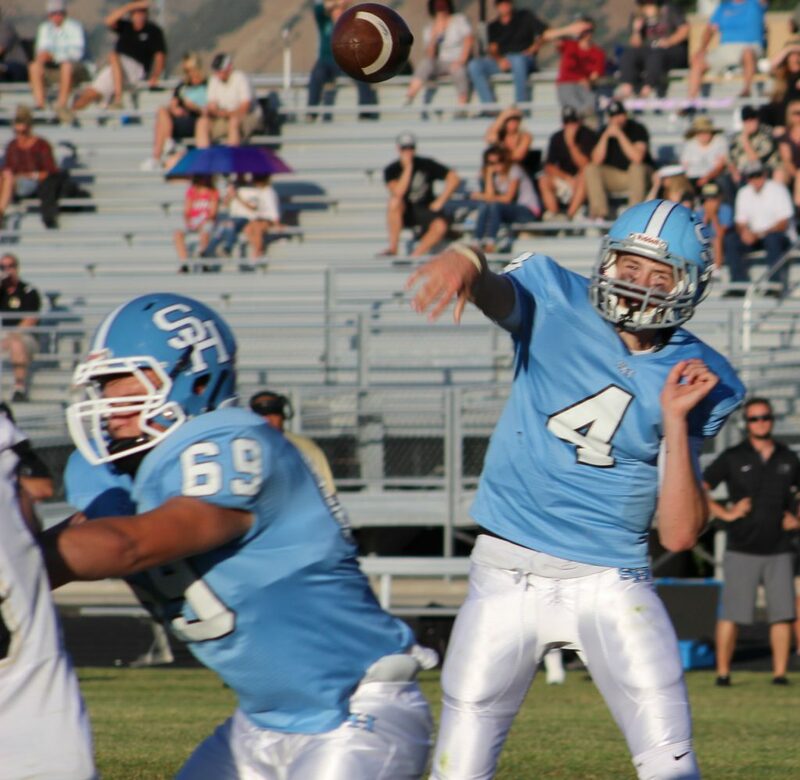 With 1:42 left in the first half, Salem Hills ran its two-minute offense and with just 4.4 seconds left, Nelson found tight end Jacob Rolfe open in the middle on a skinny post. Rolfe dove for the end zone and crashed through the defense. However, it was once again not to be for SHHS as an illegal shift penalty took points off the board for the Skyhawks. They settled for a 43-yard Alex Baker field goal to cut the halftime lead to 21-10. Parry, head coach Carl Franke and Sewell all expressed frustration at their first half performance. Sewell added that halftime adjustments made the difference against Salem. Out of the half, and with the Thunder up only 21-10, DH called a screen play that very easily could have gone bad and changed the landscape of the game for the Thunder. But Parry turned it golden with some massive YAC yardage that resulted in a 47-yard Sewell to Parry TD connection to put DH up 28-10. The Skyhawks never seemed to find their mojo in the second half as they immediately went three-and-out on the next two drives. 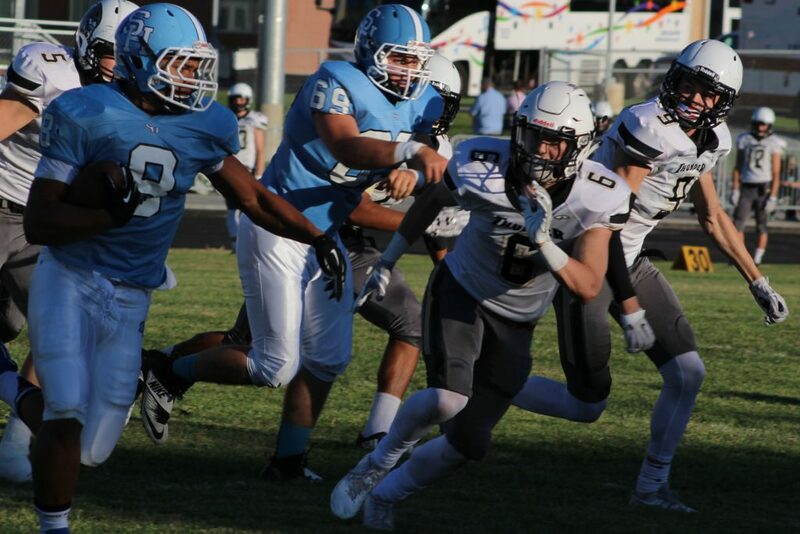 Meanwhile, Desert Hills romped the accelerator, first scoring from 12-yards out on a Sewell end around run and barely a minute later, a Sewell-to-Gavin Young long TD-pass to put the Thunder up first 35-10, and then 42-10. Less than two minutes later, after yet another SHHS three-and-out, Kolton Madsen broke free up the middle for a 54-yard touchdown. By the time the third quarter ended, the Thunder found themselves up 49-10. In the fourth quarter, some younger talent got some playing time and sophomores Logan Wilstead and Luke Watson connected on a 35-yard TD with 3:46 to go. 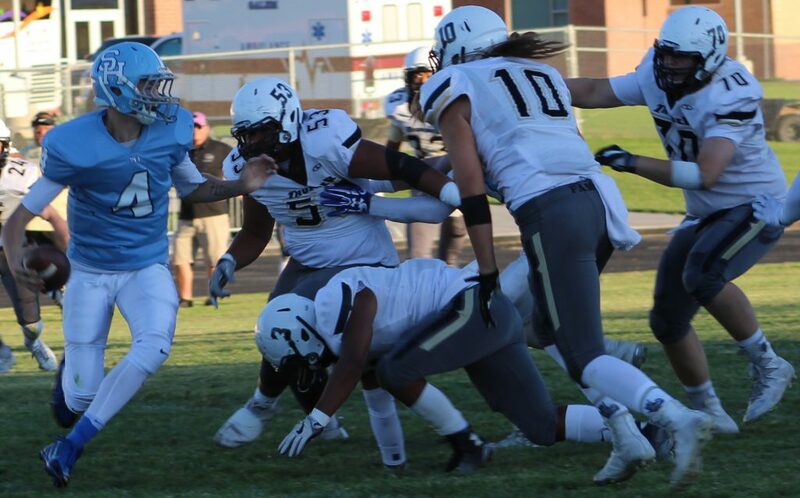 Desert Hills (1-1) will have one more tune-up game in a long road trip at Mission Hills, Calif., next week before starting region play. 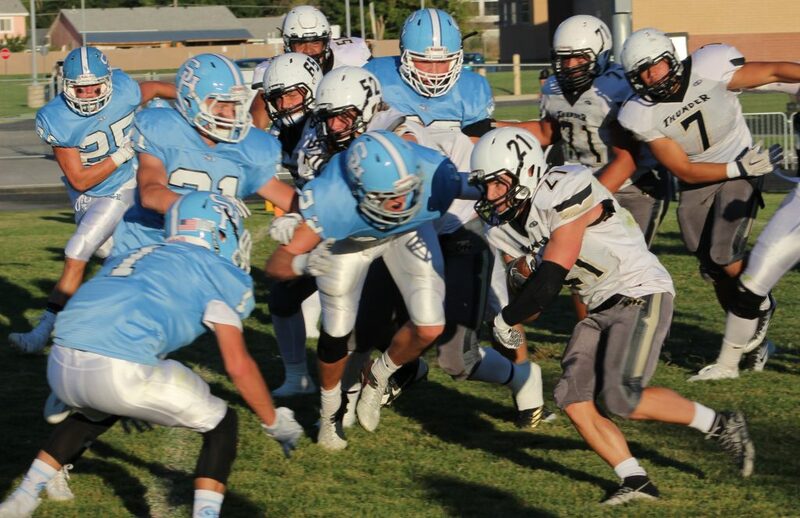 Salem Hills (1-1) will finish its preseason against southern neighbor Juab.